Why is my converted video file bigger than the original file? When you convert a video with Clipchamp Utilities, sometimes the resulting output file can be larger than the input file. your input video is already compressed efficiently and cannot be compressed further. your input video is encoded using an efficient video codec already (H.264, VP8,...) and cannot be compressed further. your input video is encoded with a codec that is more efficient than the output settings you selected. For instance, this can be the case if you convert a video into WMV for Windows/Microsoft Office applications. you convert an MP4 video to an ASF or FLV video. In these cases the resulting file will be larger than the input video because ASF/WMV and FLV are less efficient video codecs than MP4/H.264. you selected an output resolution that's bigger than your video's original resolution. 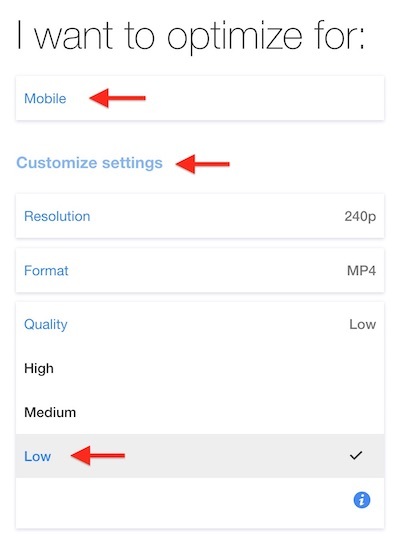 In the customize settings, choose "Keep resolution" or a lower resolution than your original video (e.g. the smallest is 280p). In the customize settings, select the "Low" quality output setting. Try a different optimize preset, for instance "Mobile" instead of "Web". If you don't need a specific format, choose the MP4 format. In the majority of cases, Clipchamp Utilities is able to significantly reduce your input video's file size, but there are some situations where the video processing technology we use behind the scenes is reaching its limits. We're sorry if your input video is one of the few where this occurs.